Book Description: When a top-ranked competitor keels over at a dog obedience trial, photographer Janet MacPhail is swept up in a maelstrom of suspicion, jealousy, cut-throat competition, death threats, pet-napping, and murder. She becomes a “person of interest” to the police, and apparently to major hunk Tom Saunders as well. As if murder and the threat of impending romance aren’t enough to drive her bonkers, Janet has to move her mother into a nursing home, and the old lady isn’t going quietly. Janet finds solace in her Australian Shepherd, Jay, her tabby cat, Leo, and her eccentric neighbor, Goldie Sunshine. Then two other “persons of interest” die, Jay’s life is threatened, Leo disappears, and Janet’s search for the truth threatens to leave her own life underdeveloped – for good. My Review: Although cats are my primary passion, I have long been a fan of the dog mysteries of Susan Conant, Lauren Berenson, and Donna Ball. 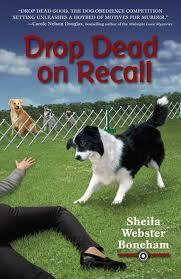 Drop Dead on Recall, the first Animals in Focus Mystery by Sheila Webster Boneham, rates right up there with the best of the best. Animal photographer/dog enthusiast Janet MacPhail, her Australian Shepherd Jay and orange tabby Leo (who has a predominant role in the story, even cluing this reader in to the identity of the killer based on his actions), drew me right into their little world. The mystery is compelling, and had me quickly turning the pages as Janet attempted to solve "the dog lady deaths." I was so touched by the subplot involving her mother moving into a nursing home, and how incredibly sweet her love interest Tom was through it all. I really look forward to seeing this relationship develop. Janet's neighbor Goldie is another wonderful character, and I'm very concerned as to why she appears so sickly. The action in the end involving Janet's heroic pets was the icing on the cake. This book is a must read for dog lovers and cat lovers. Tara's Thoughts: Guess what everybody??? In a couple weeks I'll be conducting my very first interview...with none other than Leo the cat (the TRUE star of this...gasp...dog mystery.) Stay tuned...I've been busy all weekend thinking up questions for him (well, in between naps, of course). FTC Full Disclosure: I received a copy of this book from Netgalley.